Thaw the pastry at room temperature for 40 minutes. Heat the oven to 375°F. Heat the oil in a 10-inch skillet over medium heat. Add the onions and cook until they're tender. Add the garlic and cook for 1 minute. Add the spinach and cook until the liquid evaporates. Remove the skillet from heat and let it cool. Beat the soup, eggs and dill weed in a medium bowl. Stir in the cheese and spinach mixture. Unfold the pastry on a lightly floured surface. Roll into a 13 x 9-inch rectangle. Place it in a 13 x 9-inch baking pan. Top with the spinach mixture. 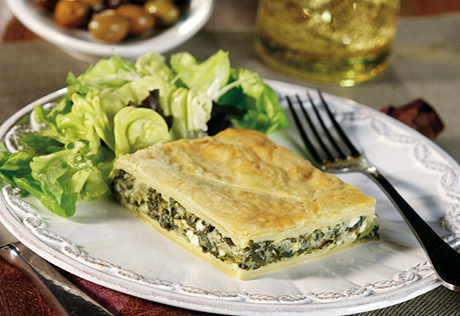 Roll out the remaining pastry sheet and place it over the spinach mixture. Cut 4 slits in the top of the pastry. Bake for 25 minutes or until it's golden brown. Tip: To thaw the spinach, microwave on HIGH for 3 minutes, breaking apart with a fork halfway through heating. Tip: Substitute Campbell's® Cream of Mushroom Soup for the Cream of Chicken Soup.